The Holiday Mash Up filled at the Eagles Hall with the sound of local music, Nov. 26. And all for a good cause- supporting Lethbridge’s vibrant music scene as well as Youth One.Though a cornucopia of different bands playing a variety of different styles of music were playing all day long, I was only able to catch local pop-punk band the Youngbloods, who closed the show. 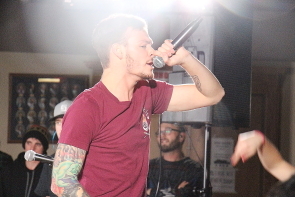 They put on their usual energetic show combining elements of pop punk and screamo music. The band members leaped all over the stage as flashing Terminator strobe lights blinked randomly all over the audience. The Youngbloods were tight and well rehearsed. In between jumping around, they effortlessly leaped to the other microphones on the stage. A highlight was their new single, which was a little more experimental than their Blink -182/ Sum 41 brand of pop punk.